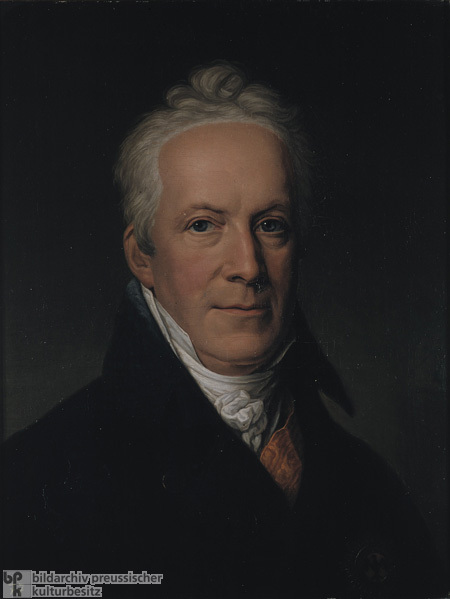 Karl August von Hardenberg (1750-1822) was appointed to the Prussian foreign ministry in 1798; from 1804 to1806, he served as foreign minister and strove to secure territorial gains for Prussia in return for neutrality vis-à-vis Napoleonic France. Dismissed twice at Napoleon’s behest, Hardenberg worked behind the scenes for Frederick William III (r. 1797-1840) to promote Prussia’s recovery after its devastating defeat at the battles of Jena and Auerstedt in 1806. In 1810, Hardenberg succeeded Karl Baron vom und zum Stein (1757-1831) as Prussian chancellor. Stein’s administration had abolished juridical serfdom among the Prussian peasantry and introduced elected municipal self-government. Hardenberg’s cabinet subsequently abolished guild monopolies in favor of a liberal market economy, extended citizenship and (on conditional terms) civil rights to Prussia’s Jewish population, introduced a new state-funded system of public education from elementary school to the university level, administered the conversion of noble-dependent peasant farms into freehold property, and introduced a reformed tax system. Like Stein and other reformers, he aimed at the promulgation from above of a constitution with new parliamentary organs but suffered defeat in the conservative reaction that spread throughout Germany and Europe after 1815. In foreign policy, he adopted a cautiously supportive stance toward France before aligning Prussia with the anti-Napoleonic coalition in 1813. Prussia took the lead in organizing the military forces and campaigns that led to Napoleon’s expulsion from Germany. The Prussian army was co-victor, alongside Wellington’s British soldiers, against a resurgent Napoleon at Waterloo. These accomplishments enabled Prussia to make valuable territorial gains, notably the acquisition of the industrially important Rhineland and Westphalia, at the Congress of Vienna in 1814-15. After 1819, Hardenberg’s reform program stalled as conservative circles supported the Prussian king in acquiescing to Austrian Chancellor Clemens von Metternich’s repression of liberal, democratic, and popular nationalist movements. Oil on canvas by Johann Heinrich Tischbein the Elder (1722-1789), c. 1810.